I’ve been roasting squash all during the month of November, and every time I use up all the squash in my kitchen, more seems to magically appear. Well, actually I just get more because I keep thinking of ways to use it. 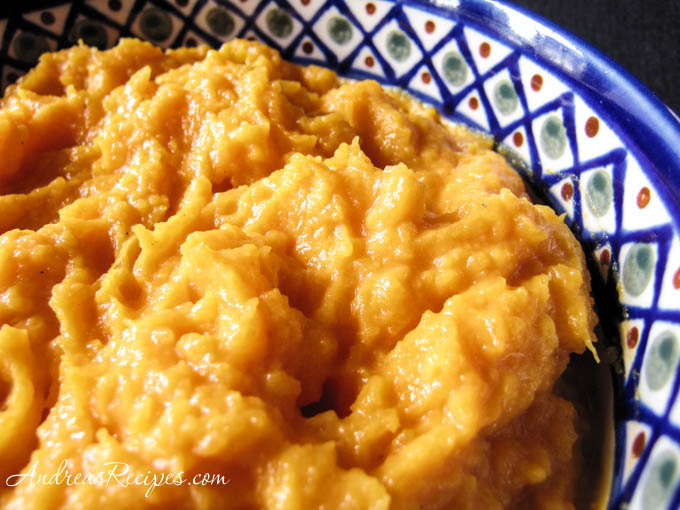 This gingered puree was an experiment that turned out pretty well. Originally I used 1 1/2 teaspoons of fresh grated ginger, but we felt that it overpowered the sweetness of the squash, so a teaspoon seemed to work quite nicely. This will make a delicious side dish for a Thanksgiving meal, or any night of the week. Stand the squash on the large end. Use a large knife or cleaver and cut in half from the stem to the bottom. If you have a rubber mallet, you can use it to tap the blunt side of the blade to help push the knife through the squash. Place the cut sides down on the prepared baking sheet and roast until the skin can be easily pierced with a knife, about 45 minutes. Remove from oven and set aside until it is cool enough to handle. Use a spoon to scoop out the flesh and put it into a bowl. Mash with a potato masher. In the sauce pan, melt the butter and milk together for about 1 minute. Mixture should be hot, but not boiling. Add the mashed squash and stir well. Add the ginger and stir. Continue cooking over low heat until the squash is heated through. Salt and pepper to taste and serve immediately. Andrea, I love butternut squash…thanks for sending in your wonderful recipe. This is simply gorgeous. I love the addition of ginger. A real kick! That looks very tasty – there’s nothing better than roasted squash and fresh ginger! that’s exactly the way i always do my butternut squash as well… the roasting brings out the flavour so much better than frying or steaming… i have fallen in love with this vegetable!